Being a first-book writer looking to nose your way into the publishing market is the weirdest thing, it elicits the most incredibly negative outlook from people. Either that or no two opinions are the same, although everybody is an authority. Of course. Generally, negative comments rule. You can’t do it without an agent. It’s really difficult to find an agent. It’s impossible to find a decent agent until you’ve had some success. It’s an impossible market to get into (being published). You don’t need an agent for a self-help book. You need an agent for a self-help book. It’s easier in the US. It’s much harder in the US. You’ll never be able to get your first book published. Funny thing is, though, every single published author once had to get their first book published. And they succeeded. That’s probably millions of first book writers. Millions. Which means it can’t be impossible. How people can hold onto these negative ideas when they’re so completely irrational beats me. I think it’s just that people love to be dirgy, it’s like a societal addiction to misery. Since nobody in the world can tell how and when I’m going to find my publisher, the responses are just choices based on pure speculation. Why choose the worst? Why not say variations on I’m sure you’ll have no difficulty at all? Why not say the nicest and most supportive thing they can think of? Because they don’t want to give a person false hope? So they give them false misery instead. Well that makes a lot of sense. One thing I do understand, is that publishers are besieged with manuscripts now because so many people write these days. So generally they tell you that you won’t get a response before 3 to 6 months. But it still doesn’t mean it’s impossible, because somebody might just flip through the pile of manuscripts waiting to be read and like the look of mine. They could read it overnight and call me the next day. Anything can happen, and it often does for people. In fact maybe it’s more likely to happen for the people who refuse to be infected by the gloom and doom virus. It’s depressing to believe you haven’t got a chance, it makes the journey so much more difficult. I had a great fantasy the other day about Oprah calling me up and saying I loved your book! The fantasy made me feel upbeat, had me laughing and whooping it up. It was pretty motivating. I’ll take ideas that carry prospect and the pleasure they give me over morbid, gloomy doomy ones any day. Imagine believing the worst and getting really depressed about it and then something fantastic happens. I’d have wasted all that time being unnecessarily unhappy. Perish the thought. 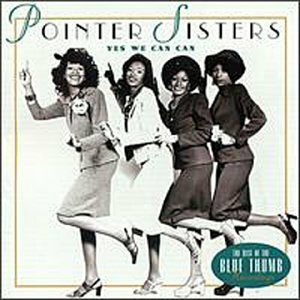 I wonder how many people told the Pointer Sisters that they couldn’t, they wouldn’t? Those three little words yes I can are like nourishment to the seeds of powerful dreams. It’s thrilling taking a risk, and doing something I’ve been afraid will heap criticism on my head and make people despise me. Listening to what I need and letting that be more important than my fear of displeasing others. The truth is, it doesn’t matter what people think. Some will accept me and some won’t, as they’re entitled to. That speaks about them, not me. I’ve never been able to actually know that it’s okay, because I’ve never risked taking the action. I’ve stayed engaged in should I shouldn’t I. My god it’s been torturous. The prison of mental debate. It’s the worst place to be, you can never reach resolution. Action, that’s the thing. So now that I’m taking action, a lot of those messages keep popping up at odd moments and totally uninvited. They get a temporary hold, but that’s about it. Today at least I can see them for what they are – Catholic leftovers. Be a good girl and don’t ask for anything, give your life away, don’t think for yourself, and don’t make God angry or even irritated. Don’t have a life. That combined with leftover messages from a social and familial culture where boys are important and girls are not, and a family rule that says my mother’s needs are paramount and beside her I don’t exist. Those messages don’t have so much power any more, they’re kind of deflated and miserably scrawny things. Starved of attention from me. See them shrivel and die. Yes, there’s a lot to be said for action. Speaking of which, today I must phone recording studio man and find out about: i) demo cd, ii) how to record for my blog, iii) sitting in on recording sessions. Right. Make those phone calls, Jennifer. Other actions: sing, play piano, post this blog, write and post article promoting blog, upgrade blog bio, write press release for IdeaMarketers and article for Searchwarp and post, do work on script, go for walk to buy milk and experience sun on face, finish bag that I started yesterday which isn’t Gucci but is pretty classy if I say so myself. I found an old US$1 note which I brought back from my last trip there. I’ve changed the numbers to US$1 million. No harm in having a bit of fun. So long as I’m also doing the action. Gotta go. Phone calls to make, things to do. p.s. What’s the point in finding out the cost of all the things I need if I can’t afford them? It’s the first action step. I need to know. There was a time when I said “I wish I could have these things but I know I can’t because I don’t deserve, so I’m not even going to see how much they cost – what’s the point?”. Now I’m saying “this is what I need, and this is what it costs”. I don’t know where the money will come from, but I’m not going to let that stop me from doing whatever I can and from believing that I can access what I need. Solutions come from round the corner, you never see them coming. They’re always a surprise. What’s the point in believing they can’t happen when they can, and making yourself miserable for nothing? The most amazing thing has happened. I’m learning about backlinks and internet marketing, keywords etc. I typed “Stepping out of History” into Google’s search and there are 112,000,000 results. Of which a reference to one of my blogs is the FIRST!!!!!!!!!!!!!!!!!!!!!! How did that happen? I’ve started putting together a strategy to get my blog to people’s attention, but haven’t started doing it yet. Just expressed my intention. Ha ha ha. I saw it yesterday. I walked to the shop in the early evening via the beach. The tide was out, the ocean calm as a lake, the air cool, no wind. I felt relaxed and light again – as in not a lot of weight, but also as in all lit up on the inside. I’ve spent so much time in my life struggling to get to the surface of my inner boggy swamp, to be able to do something in the world that’s meaningful to me, and to be able to do it in a way that works for me. You know, not follow somebody else’s instructions. Every single time my way has just landed me in the dwang. I’ve had plenty of invitation to just give up and get an ordinary job and stop dreaming that I can have the inner, creative and material freedom I’ve got such a strong feel for but haven’t been able to make into anything real so far. In childhood that invitation came from outside of myself (hardly an invitation, more like a prohibition – don’t you dare think you’re important), but in adulthood it’s mostly come from within. Strange that a person can long for something and believe in some part of them that they can have it if they just keep persisting – yet also have a part that believes they’re being unrealistic and irresponsible etc. and that they should give up because they’re never going to get what they want. Well, this person anyway. Worse, I had no evidence in my life that my dreams could come true! Quite the opposite. So now my logic tells me there’s nothing remotely real about my dreams, and moreover I’m too old for them to come true now, I haven’t got a chance in hell of being a star of any sort, all I can hope for is to enjoy my writing and music as a hobby. Well, my logic told me I couldn’t get to the top of a Google search without a huge amount of work. And it was wrong. Now I have some evidence that my dreams can come true. REAL HARD EVIDENCE. Yes!!!!! The power of longing. It defies logic and everything that stands in its way. My blog is just the start. Watch this space. Good morning world.